Custom text recoding using regular expressions. This widget inputs a segmentation, creates a modified copy of its content, and outputs a new segmentation corresponding to the modified data. The modifications applied are defined by substitutions, namely pairs composed of a regular expression (designed to identify portions of text that should be modified) and a replacement string. It is possible to “capture” text portions using parentheses appearing in the regular expressions, in order to insert them in the replacement strings, where sequences &1, &2, etc. correspond to the successive pairs of parentheses (numbered on the basis of the position of the opening parenthesis). 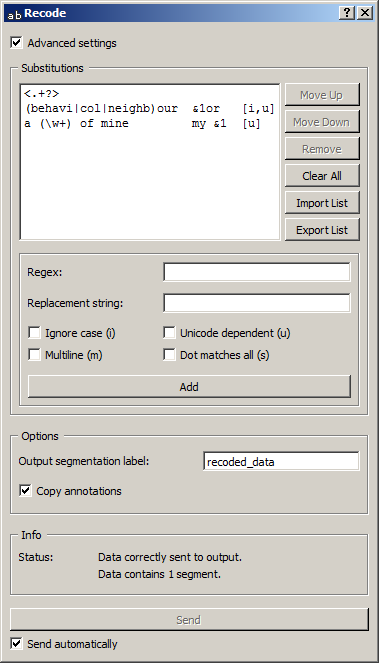 Note that Recode creates a copy of each modified segment, which increases the program’s memory footprint; moreover this widget can only work on segmentations without any overlap, which means no part of the text is covered by more than one segment. The interface of Recode is available in two versions, according to whether or not the Advanced Settings checkbox is selected. Figure 1: Recode widget (basic interface). The Options section allows the user to define the output segmentation label. The annotations of each input segment are systematically copied in the corresponding output segments (see Advanced interface, option Copy annotations). In its advanced version, the Recode widget allows the user to define several substitutions and to determine the order in which they should successively be applied to each segment of the input segmentation. Figure 2: Recode widget (basic interface). On figure 2 above, we can see that three substitutions have been specified. The first deletes XML/HTML tags (it replaces them with the empty string). The second replaces occurrences of British English forms (behaviour, colour, and neighbour, possibly capitalized, since the Ignore case option is selected) with their American English variants (behavior, color, and neighbor), while the last replaces sequences like a X of mine with my X; thus they illustrate the possibility to “capture” text portions through parentheses appearing in the regular expression. I've just met a neighbour of mine. I've just met a neighbor of mine. I've just met my neighbor. The first buttons on the right of the substitution list allow the user to modify the order in which they are successively applied to each segment of the input segmentation (Move Up and Move Down), to delete a substitution from the list (Remove) or to empty it entirely (Clear All). Except for Clear All, all of these buttons require the selection of an entry in the list beforehand. Import List enables the user to import a list of substitutions in JSON format (see JSON im-/export format, Substitution list) and to add them to those already selected. Export List enables the user on the contrary to export the list of substitutions in a JSON format file. The remaining part of the Substitutions section allows the user to add new substitutions to the list. To define a new substitution, one must specify the regular expression (Regex) and the corresponding replacement string (Replacement string); the latter can be left empty, in which case the text portions identified by the regular expression will simply be deleted. The Ignore case (i), Unicode dependent (u), Multiline (m) and Dot matches all (s) checkboxes control the application of the corresponding options to the regular expression. Adding the new substitution to the list is achieved by clicking on the Add button. 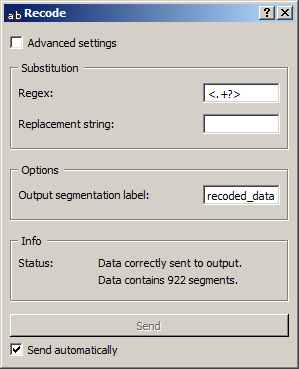 The Options section allows the user to define the output segmentation label. The Copy annotations checkbox copies every annotation of the input segmentation to the output segmentation. Recode is one the widgets that can be controlled by means of the Message widget. Indeed, it can receive in input a message consisting of a substitution list in JSON format (see JSON im-/export format, Substitution list), in which case the list of substitutions specified in this message replaces those previously specified (if any). Note that removing the incoming connection from the Message instance will not, by itself, remove the list of substitutions imported in this way from the Recode instance’s interface; conversely, this list of files can be modified using buttons Move up/down, Remove, etc. even if the incoming connection from the Message instance has not been removed. Finally, note that if a Recode instance has the basic version of its interface activated when an incoming connection is created from an instance of Message, it automatically switches to the advanced interface. As one of the rare widgets of Textable that do create new strings and not only new segmentations, Recode is prone to a very specific and possibly disconcerting type of error, which can be best understood by studying the example given in the documentation of Preprocess (section Caveat), where all that is said about Preprocess also applies to Recode. The instance’s input segmentation contains overlapping segments, which preempts the application of recoding operations. The widget instance has received a JSON message on its Message input channel and the keys and/or values specified in this message do not match those that are expected for this particular widget type (see JSON im-/export format, Substitution list). Regex error: <error_message> (substitution #<n>). The n-th regular expression in the Substitutions list is invalid. Reference to unmatched group in replacement string. A replacement string specified by the user contains a reference to a numbered variable (&1, &2, ...) which turns out to not always have a matching element. For more details concerning the regular expression syntax, see the Python documentation. Note that option -u (Unicode dependent) is activated by default. For more details on the effect of options -i, -u, -m, and -s, see the Python documentation.